Did you know that more than 500,000 Americans declare bankruptcy each year? While unfortunate, it’s helpful to know that you are not alone when it comes to dealing with a bankruptcy. Even after your bankruptcy is discharged, there is the aftermath to contend with as well; namely, repairing your credit. With so many people experiencing bankruptcy and so much financial data going through the credit bureaus, the chance for error is great. That’s why it’s imperative that you review all of your credit report information for accuracy, particularly the data surrounding the specifics of your bankruptcy. We’ll walk you through why it works and what to do so you can start repairing your credit today, even with a bankruptcy in your past. 1 How long does a bankruptcy stay on your credit report? 2 How does a bankruptcy affect your credit score? 3 How can I rebuild my credit after bankruptcy? 4 Can a bankruptcy be removed from your credit report? 5 Can you remove a bankruptcy on your own? 8 Discount for Family Members, Couples, and Active Military! 9 Remove Your Bankruptcy Now! The length of time you’ll see a bankruptcy stay on your credit report depends on what type it is. A Chapter 7 bankruptcy remains on your credit report for 10 years while a Chapter 13 bankruptcy remains on your credit report for just 7 years. However, contrary to popular belief, bankruptcies can be removed from your credit report early and you can get credit after a bankruptcy. You do NOT have to wait up to 7 or 10 years before being able to get a mortgage, car loan, or any other type of credit again. In fact, it usually only takes a few years to be able to get access to loans and credit cards again. But that can seem like a long wait when you need cash upfront. Plus, once you do start to qualify again, you’ll still be paying extraordinarily high interest rates. Rather than getting stuck with high interest rates and low balance maximums, work on negating the effects of bankruptcy as much as possible. Between disputing the bankruptcy itself and taking concrete actions to rebuild your credit, you can get much better offers for credit cards and loans. One mistake doesn’t have to set you back financially for the next ten years. Read on to find out the various ways in which you can recover from having a bankruptcy on your credit report. How does a bankruptcy affect your credit score? Having a bankruptcy on your credit report can be devastating to your credit scores. According to FICO, for a person with a credit score of 680, a bankruptcy on your credit report will lower your score by 130-150 points. For a person with a score of 780, a bankruptcy will cost you 220-240 points. That one event immediately drops you several categories lower and impacts your ability to access credit, and yes, the higher your initial credit score is, the more it falls. You might not be eligible for future loans or credit cards, and if you are, you’ll most likely end up paying much higher interest rates. Not only that, the amount you can borrow will probably become limited. 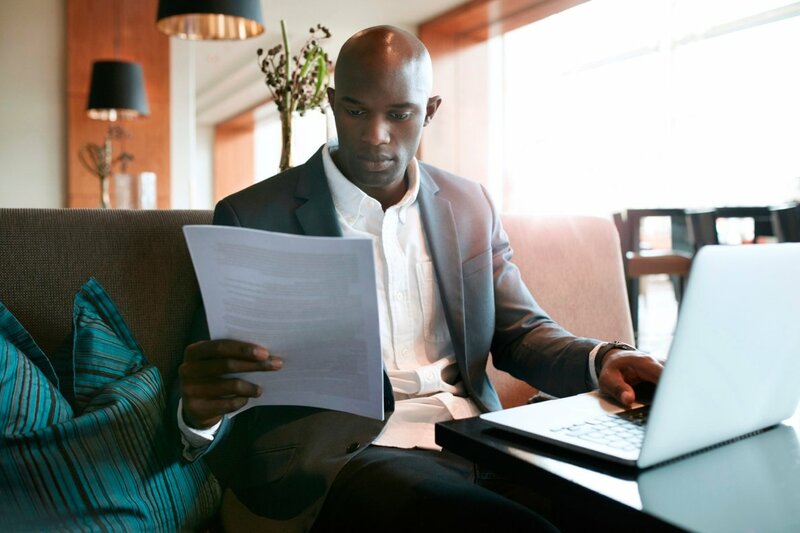 While filing for bankruptcy may be the best financial decision at this point in your life, it’s still important to understand how and why it affects your credit. The most important thing you can do to rebuild your credit after a bankruptcy is getting it removed from your credit report. Equally important is learning and changing your personal finance habits so that it doesn’t happen again. This might involve reviewing your income and expenses or bulking up your emergency fund to prevent future financial hardships. The most important ongoing habit you can begin is to pay all of your bills on time because your payment history accounts for the largest portion of your credit score. Even a single 30-day late payment can cause a significant dip, so imagine how bad it could be if you regularly miss a payment. Your other best bet for rebuilding your credit after bankruptcy is to avoid accruing new debt. Depending on what type of bankruptcy you filed, you probably had much of your debt discharged. Even though the bankruptcy itself is a major negative item on your credit report, consider the rest a blank slate. Avoid racking up additional debt because that also has a significant impact on your credit score. Yes, a bankruptcy isn’t a fun process to go through. But look on the bright side and consider it an opportunity to start fresh with your finances. Can a bankruptcy be removed from your credit report? The credit bureaus have active campaigns online to make you think that it’s not possible. They pretend to be helpful, but they have ulterior motives. They don’t say it outright, but the way they word their interpretation of the FCRA makes people think that it can’t be done. The worst thing about that is that a lot of the top credit sites parrot the information which makes for a lot of misinformation online. However, as you will see below, bankruptcies absolutely can be removed from your credit report. When disputing a bankruptcy, you can’t file a dispute with one of the bureaus and expect it to apply to all three. Instead, you’ll have to file three separate disputes with Equifax, Experian, and TransUnion. Make sure the wording of your dispute doesn’t make it sound frivolous. Stick to the facts and don’t get emotional. Sometimes, the less you say, the better. 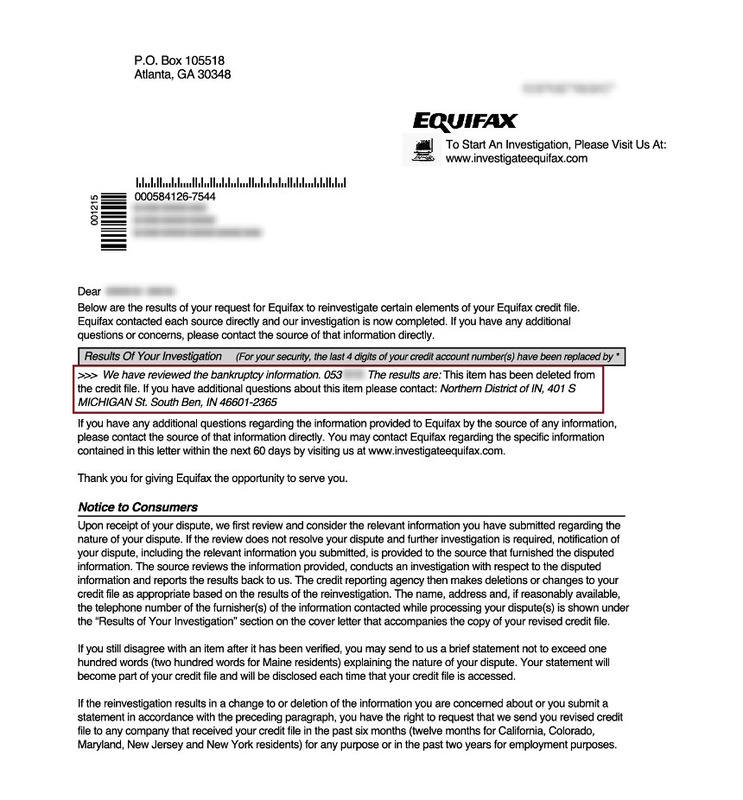 Yes, you have certain protections under the FCRA, but the credit bureaus also have protocols in place to shut down consumers who don’t have legitimate disputes. Can you remove a bankruptcy on your own? Like all negative item disputes, it’s entirely possible to complete the process on your own; however, it’s a lengthy and tedious process that doesn’t guarantee results. You can dispute the bankruptcy either by stating an inaccuracy of the information included in your credit report or by asking the credit bureau how it verified your bankruptcy. As with any dispute, they must respond to your procedural request letter within 30 days. In most cases, they’ll say that they verified it with the courts, but this is unlikely. You must then contact the court to ask how they verified your bankruptcy. If they respond that they never verified it, you should get that statement in writing, send it to the credit bureau, and ask to have the bankruptcy removed. This method isn’t guaranteed but is might be worth trying. Otherwise, enlist the help of a credit repair company to navigate the process for you. Credit repair companies are highly experienced at disputing negative items on your credit reports. They specialize in getting bankruptcies deleted from your credit report. They can also removed the accounts “included in bankruptcy” like charge offs and collections. 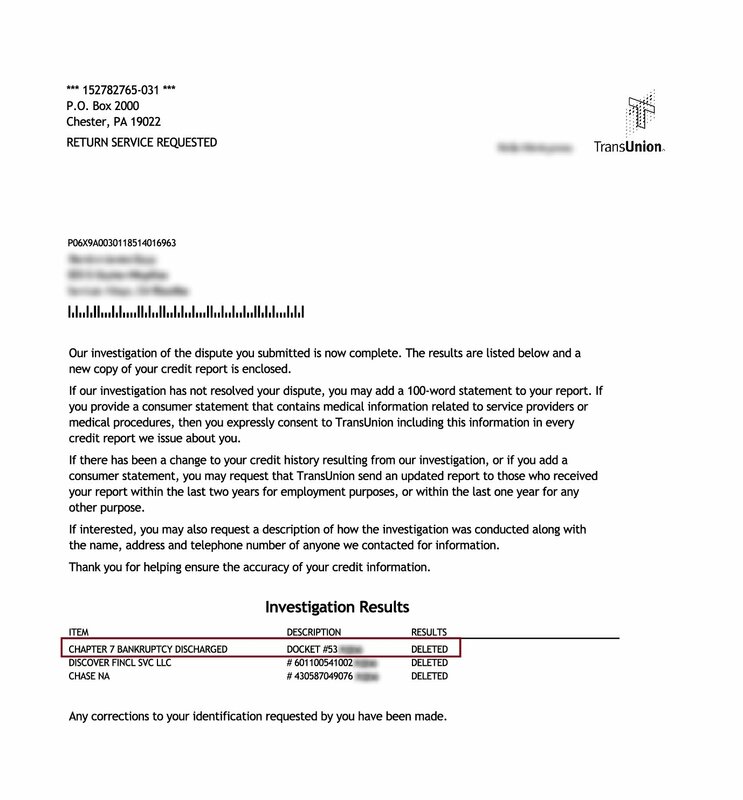 Check out the story below to see how one of our readers got a bankruptcy deleted from his credit reports. Want to Remove a Bankruptcy from Your Credit Report? A few years ago, the company I worked for went out of business. It took me quite awhile to find a new job. The bills just kept piling up. It got to the point that I was no longer able to make my payments, not even the minimums. All of my credit card accounts were charged-off and sent to collection agencies. My life became a nightmare of collection calls and endless harassment from debt collectors. It was a tough decision for me, but I decided to file bankruptcy. Although the bankruptcy had relieved me of the debt, the damage to my credit was already done. I knew I had to do something about my credit. I wasn’t just going to sit there and wait for seven to 10 years until the bad credit fell off of my report. I tried to apply for new loans to show them that I was creditworthy, but every single bank denied me. Getting turned down for loans over and over again was frustrating and embarrassing. A friend told me about Lexington Law Firm and was ranting and raving about how awesome they were. I was skeptical at first, but after seeing what they did for him, I knew I had to give them a try. I called 1 (800) 220-0084 and was connected to a credit professional who was very friendly and understanding. She was also exceptionally knowledgeable. I asked her many questions about the negative items on my credit report and told her about my situation. And I’m not an exception to the rule. In 2016, Lexington Law successfully removed over 362,000 bankruptcies from individuals’ credit reports. In total, they removed over 9 million negative items for the year. So if you have other negative items plaguing your credit in addition to a bankruptcy, Lexington Law is your go-to resource to get those items successfully removed. They’ll also make sure that all your credit information is correct, which is especially tricky even after your bankruptcy has been discharged. Those creditors are required to adjust their reporting of your discharged accounts, but many fail to do so. It’s up to you to make sure your credit history is accurate and it often takes the help of a professional like Lexington Law to ensure this happens. Discount for Family Members, Couples, and Active Military! Lexington Law Firm is now offering $50 off the initial set-up fee when you and your spouse or family members sign up together. The one-time $50.00 discount will be automatically applied to both you and your spouse’s first payment. Active military members also qualify for a one-time $50 discount off the initial fee. If you’re sick of having bad credit, let the professionals take care of it for you. They can delete all kinds of negative items from your credit reports, including bankruptcies, foreclosures, repossessions, charge offs, judgments, tax liens, collections, late payments and more.